CBS Automotive work alongside vehicle manufactures to offer the highest-grade insurance approved vehicle security systems. Vodafone Protect & Connect 5 conforms to the highest level of insurance accreditation for stolen vehicle tracking systems, Thatcham Category 5. As such, it offers you the ultimate security protection for your vehicle to prevent vehicle theft. The Cat 5 driver card is an inconspicuous pocket-sized card that you carry with you whenever you drive your vehicle. On departure of your vehicle, the system automatically arms itself. If the vehicle is moved without the driver card present, Vodafone Automotive's Secure Operating Centre is notified immediately to a potential theft. This means that even if your vehicle is taken using your own keys, the theft is detected immediately. The Protect and Connect 5 uses a user-friendly application that allows you to set geo fences, speed alerts as well as the facility to perform a vehicle health check. You can download this app in a demo form, from the App Store today. If you have any questions regarding this product then feel free to call the professionals at CBS Automotive in Cambridge on 01223563030. Remote Engine Immobilisation technology permits Police to authorise Vodafone Automotive to send an alert to the vehicle to prevent the engine being restarted once it comes to a standstill. This significantly increases the chance of your vehicle being recovered undamaged, and can also help Police to avoid high speed pursuit of suspect vehicles. We have added some brochures for your reference, for any technical enquiries or to arrange an installation please call us on 01223 563030. 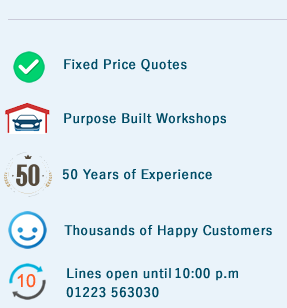 Please feel free to browse our installation gallery to see just a sample of the vehicles that we have installed in over the last 50 years. We pride ourselves on the standard of work that we carry out, therefore CBS Automotive carry out Cat 5 installs for main dealers across Cambridgeshire. With our accredited Thatcham Approved technicians, you can be sure that your vehicle is with professionals.